Monument commemorates the firefighters who lost their lives in the Ash Wednesday fires. 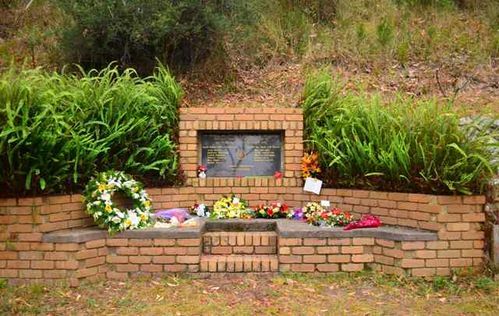 On Wednesday 16th February 1983 , a call was received from Narre Warren tanker that they and another tanker from Panton Hill were in trouble and trapped. They where situated on St Georges Road, Upper Beaconsfield, on the top of a hill. When the change came through the fire travelled from High St, up the hill to St Georges Rd, a distance of half a kilometre, in eleven Seconds. With such speed and ferocity, they never stood a chance. The radio went dead, fire-fighters were fighting for their own lives, trying to take cover by getting under their trucks for protection. At dawn the next morning two burnt out fire trucks and twelve fire fighters where discovered by Narre Warren First Lieutenant, Frank Clarke at St Georges Road, Upper Beaconsfield. One of those on the truck was his Captain, and 5 other members from Narre Warren. Forty seven people, fire-fighters and civilians, were to die on this day at fires all over the state. Forty six of these people died when the wind changed.